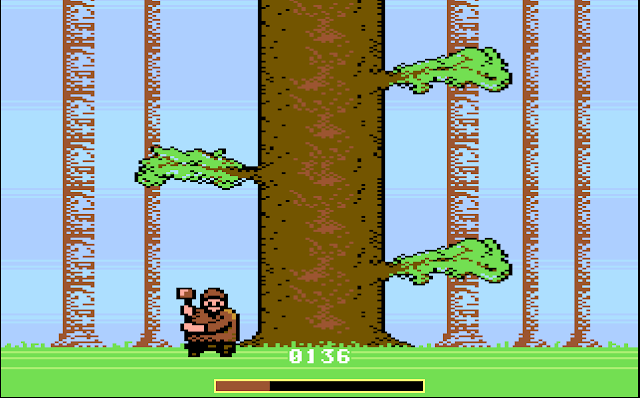 Indie Retro News: Lumberjack - Chop down a tree as fast as you can in this C64-Amiga conversion! Lumberjack - Chop down a tree as fast as you can in this C64-Amiga conversion! Last year via the CSDb database, the Megastyle, Protovision & Atlantis group released the C64 homebrew game of ' Lumberjack ', which put you in the mighty boots of a Lumberjack chopping down a tree as fast as he can, without being bashed by the big branches above. It was a charming little game with a bit of comedy mixed in which was met with positive comments such as this game is highly addictive. So if you've played it and would rather experience it on the Amiga, now you can, as Cobe and Lemming880 has done a fan made conversion tested on both an A500 and A1200. Released yesterday, this game is an almost 1 on 1 conversion but with a main difference as there is no speed limit. So basically you can chop the tree's down as fast as you can, which was limited on the C64. Furthermore the fan coders also said they didn't like how on the C64 after 150 point time/energy starts to fade really fast, so in this version energy is fading a little slower.... For further information including future developments, head on over to the discussion site linked below.